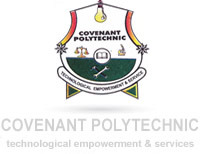 Covenant Polytechnic, Aba (CPA) Releases First and Second Semester Results for 2018/2019 Academic Session. The Management of the Covenant Polytechnic wishes to inform all students that the First and Second Semester for the 2018/2019 academic session has been released and uploaded online. The Management applauded the Students for their hard work that yielded them good grades in the last academic session. The Chairman governing council Hon. Dcn Iyke Nwoke urge the students of the polytechnic to put more effort and work hard in order to graduate with a good and deserve result also to be a worthy ambassador's of the institution. Students are advice to login to the school website and check their result. Enter Username and Password in the box provided. Click on the Login Button to check their results.